On a recent visit to Boscobel House and Gardens in Garrison, New York, I had trouble figuring out whether to fix my gaze on the man in a bonnet ringing a bell or the gorgeous sunset taking place over the Hudson River. Luckily for me I was attending a performance of Pride & Prejudice, one of the many fun repertory plays put on by the Hudson Valley Shakespeare Festival, which sets up camp at Boscobel each summer. Since the Festival performances take place in a large, open-air tent, I was able to enjoy both the bellringer and the sunset behind him. The flier for “Pride & Prejudice” features nature’s dramatic backdrop. As written about previously on More Time to Travel, the Hudson Valley has no lack of architectural beauties, ranging from Westchester’s Kykuit and Philipsburg Manor to the many estates lining the Hudson up in Duchess County, such as the Vanderbilt and Roosevelt mansions and the recently restored Thomas Cole House in Catskill, NY. Putnam County’s bid for house-tour glory is the quieter Boscobel House and Gardens, located just south of the quaint river town of Cold Spring (about a 90-minute drive or train ride north of New York City). The Boscobel House at sunset. Picnickers before the show enjoying the views of the Hudson River and West Point (on the hill far right) from the sweeping lawn in front of the house. Deemed “The Best Place to Picnic” by readers of Hudson Valley Magazine, the restored-to-a-T Federal-style mansion, built in the early 1800s and named after a famous estate in England, was originally situated on a large working farm in Montrose, New York. It was a showpiece in its day but by the 1950s the house had fallen into neglect, with its beautiful woodwork ornaments being stripped and sold off. When the whole house was threatened to be razed, a local fundraising group bought the house, and it was dismantled and stored in various barns in the local area. In 1956, with the timely monetary help of Reader’s Digest co-founder Lila Acheson Wallace, the preservationists secured 16 scenic acres of land in Garrison, and painstakingly reassembled the house there. Wallace took an active interest in the restoration of the house in its new spot, donating money for the creation of formal rose gardens and arbors of mature trees that looked as if they had always surrounded the house. Today people come for guided tours of what Governor Nelson A. Rockefeller once called “one of the most beautiful homes ever built in America” (which had a more historically accurate overhaul in the 1970s and now sports a deep-gold color theme). Visitors also enjoy the galleries and gardens, partake in the house museum’s historical and horticultural programs, attend lawn dances and period-music concerts, and some even do yoga on the lawn overlooking the Hudson every Monday night in the summer. But one of the best things that happened to Boscobel was its 1987 decision to host the fledgling Hudson Valley Shakespeare Festival. HVSF, which also has a traveling troupe, has performed for more than 500,000 patrons over the years, all the while keeping its intimate yet airy feeling under its custom-designed white tent. The summer-long annual Festival specializes in provocative and playful reimaginings of the Shakespeare classics, but also produces more recent plays. Most of these non-Shakespeare plays have a link to yesteryear, such as Thornton Wilder’s Our Town and this year’s brand-new production of Pride & Prejudice that I enjoyed. As I learned from my recent evening at Pride & Prejudice, the way to “do” a 7:30 pm play at Boscobel is to pack a full picnic dinner to enjoy before the show with a group of friends on the grassy lawn overlooking the Hudson and West Point. A picnicker “nature bathing” before that night’s play. I hadn’t known about the picnicking aspects, so my friend and I bought some salads and cookies at the casual café in the smaller tent next to the Large Tent. We also pre-ordered two chilled white Sangrias which were waiting for us at intermission (yum!). Glowing during intermission: The house, the café tent, and the Large Tent for the show. 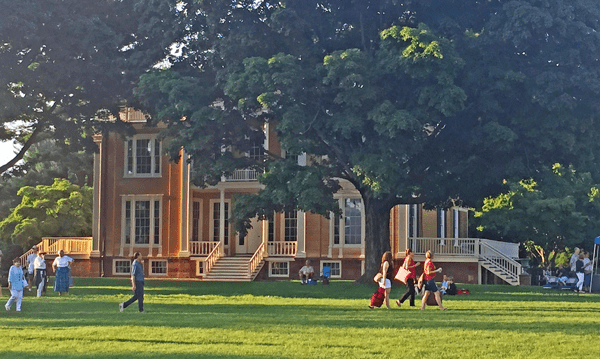 As the sun set and spotlights illuminated the golden Boscobel House, actors started quoting dialogue directly from Jane Austen and we settled in for a very bucolic and civilized experience that I know Lila Wallace would have approved of these 60 years later. Well, except perhaps for the part where a grouchy Darcy began dancing the Batusi. Sunset view from my seat at intermission. *Photos by Laura E. Kelly unless otherwise noted. What a wonderful and scenic way to spend an evening- lucky you! Looks like it’s quite an experience!